Babelgum is a peer-to-peer online video service founded by Italian billionaire Silvio Scaglia, which like Joost (see our review), aims to combine the “lean-back experience” of television with the interactivity and social elements of the web. And while further comparisons are inevitable — the two programs have a similar minimalistic interface, and both are designed to run in full screen mode so as to deliver a television-like experience — Babelgum hasn’t generated nearly as much hype as Joost, and currently a closed beta, is a lot further behind in the development cycle. It’s also possible that the two companies are aiming for a slightly different market. Where Joost has made much of its success in signing up big media partners including MTV, Comedy Central, CNN, Sony Pictures, and CBS; Babelgum’s website hints at a different strategy. By helping niche content find and connect with niche audiences, the company hopes to exploit the “Long Tail”. Niche content – especially if it’s good – can find an audience that rivals or exceeds the mainstream TV audience in any local market. Babelgum’s breakthrough technology means the content is easy for users to see in high-quality video streaming and there is usually no distribution cost to the content owner. So it is really an ideal platform for content owners to serve directly the Long Tail of viewers’ interests not addressed by today’s broadcasting television networks. Currently Babelgum has a very limited amount of content (accessible to private beta testers, anyway) but already I can see evidence of a different approach. 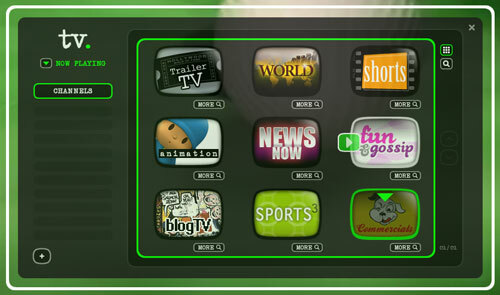 Most of the programming is independent, and notably their is a video blog channel with episodes of Rocketboom, for example. As peer-to-peer technology has the potential to really lower the barriers to ‘television’ distribution (despite the headaches it might cause ISPs), it’s great to see a company offering smaller producers access. Content on Babelgum will be free to viewers (ad-supported), and producers who have signed up as part of the launch will be offered a minimum revenue guarantee of “$5 for each 1000 unique views of a clip.” Something which is bound to appeal to independents. Aside from the content, Babelgum’s existing features include the ability to rate and bookmark clips, as well as create a playlist of channels. In the future, Babelgum will offer more social elements, such as “discover[ing] new content through friends, contacts and people with shared interests”, and promises that the service will “learn what you like” so that over time it “just gets better”. Whether Babelgum can overcome Joost’s first-mover advantage and make a success of it’s niche content strategy — against a backdrop of big media competition — is yet to be seen. But either way, the peer-to-peer Internet TV space looks a lot more healthy with at least two competitors rather than just one. Sadly at the moment neither of these are going to replace my Media Center (part of Vista) experience for one simple reason….. They claim to be a “lean back” experience, but where’s the remote control. I can’t sit on the couch with a beer in one hand, a remote in the other and…. well, you get the drift. Joost on my Mac mini recognised the Apple Remote. So I expect any programmable remote could work with either service. Competition is very healthy, feels likes Joost has the first mover advantage. Only time will tell who gets traction coming out of BETA and gets the love from users. They both have much more of a social video networking vibe rather than just being a video platform. Will be fun to see who comes out on top! We like Joost a lot – that’s why we started JuicedonJoost.com about it, but we agree that it’s not perfect and not necessarily the answer to the “We hate cable” situation. For mass acceptance, quality, brand-name content must be presented in a simple-to-use fashion. My wife has struggled with the Joost interface (still not like a TV), and the download is spotty at best. It’s no fun watching a show in 2-3 second increments! going thnrough a few of the articlees I realized it’snew to me.